After consecutive wins over the Buffalo Bills and Washington Redskins, the Miami Dolphins arrived at Cleveland Stadium on October 10th, 1993 riding high. Miami was 3-1 and in first place in the AFC East. The Cleveland Browns also entered the day with a record of 3-1 as much of the football world watched one of the more intriguing match-ups of Week 6. The Browns were looking to avenge their first loss of the season, a defeat to the Indianapolis Colts. Cleveland was led by former University of Miami quarterback Bernie Kosar and one of the more versatile running backs in football in Eric Metcalf. The Browns struck first on a 14-yard touchdown pass from Kosar to Michael Jackson, but Miami rallied to grab a 10-7 lead after a long field goal by Pete Stoyanovich and a 13-yard touchdown toss from Dan Marino to Mark Ingram in the second quarter. With Miami driving late in the first half to extend its lead, Marino stepped back to pass and after planting to throw, went to the ground. Marino left the game with a foot injury and would not return and was replaced by left-handed backup Scott Mitchell. Mitchell's day started poorly as Mitchell had an interception near the Cleveland goal line returned 97 yards for a touchdown by Najee Mustafaa to give the Browns a 14-10 lead at the break. Mitchell however, would rally the Dolphins for a 24-14 victory with third quarter touchdown passes to Tony Martin and Keith Jackson. Mitchell would finish the day with 118 yards passing while the Miami defense recorded six sacks with three coming from defensive end Jeff Cross and two more from linebacker Bryan Cox. The Dolphins also knocked Kosar from the contest in the second half. The diagnosis on Marino however, was not a good one. Marino had torn his Achilles tendon and was done for the remainder of the 1993 season thus ending his streak of 145 straight starts for Miami. Mitchell would be one of four quarterbacks to see action that season for the Dolphins along with Doug Pederson and Steve DeBerg. Mitchell finished 1993 with a 3-4 record as a starter with 1,773 yards passing, 12 touchdowns and eight interceptions. Despite the loss of Marino, the Dolphins went on to win five of their next six games to get off to a NFL-best 9-2 start. Unfortunately, Miami dropped their final five games to finish 9-7 and narrowly miss the playoffs. But while Miami was able to finish with a 9-7 record in 1993, many still sit and wonder whether the 1993 squad was one of Super Bowl caliber had it not been for a season-ending injury to their future Hall of Fame quarterback that mid-October Sunday. 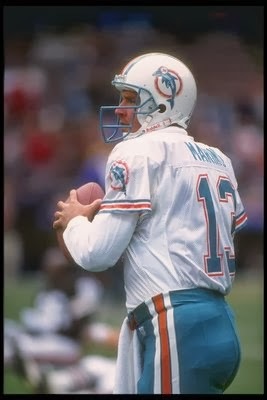 Marino would return the following season to lead the Dolphins to a 10-6 record and an AFC East title while being named to the Pro Bowl. Mitchell would go on to sign with the Detroit Lions the ensuing offseason where he helped lead Detroit to three playoff appearances in five years.